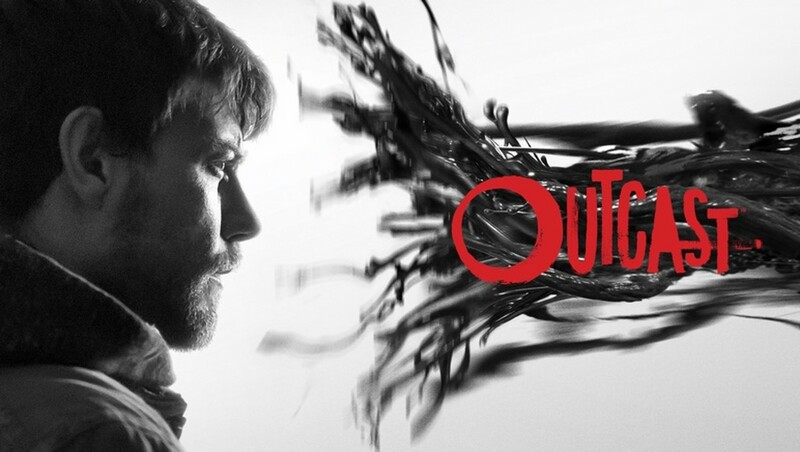 I don’t usually get to watch a lot of TV these days, so I don’t normally get Cinemax, but I signed up temporarily for the sole purpose of watching Outcast (created by Robert Kirkman), and I certainly don’t regret it. What I do regret is that I didn’t start watching sooner. Nonetheless, I’m thrilled that I finally had the opportunity to catch up on all the current episodes. Now, I eagerly await the last two of the season. Throughout his life, Kyle Barnes (Patrick Fugit) has been plagued as his loved ones suffer from demon possession. He and Reverend Anderson (Philip Glenister) unite for a mission to fight the demons and determine why they’re targeting the people in Kyle’s life. Kyle is desperate for answers so he can get his family—a catatonic mother (Julia Crockett), an estranged wife Allison (Kate Lyn Sheil), and young daughter Amber (Madeleine McGraw)—back. He deeply values the family that remains, namely his foster sister Megan Holter (Wrenn Schmidt), with whom he bonded over the childhood torment unleashed by their foster brother Donnie (Scott Porter). Schmidt does a fantastic job conveying the lingering devastation that often follows such trauma, yet this vulnerability is balanced by her obvious strength and determination to protect her family. Meanwhile, the reverend faces a desperation of his own as he realizes his exorcisms weren’t as effective as first believed. And so begins his tailspin descent into desperation and jealousy when he realizes that Kyle has the ability to expel demons, an ability that comes naturally, yet becomes reluctant to use it since it sometimes leaves people in a vegetative state, much like his mother. The dynamic between Kyle and Reverend Anderson is fascinating to watch as ensuing events play out. Mystery and grotesque imagery hits you from the very beginning of the first episode, but as the characters and plot steadily develops, it becomes clear that Outcast doesn’t solely rely on gore to incite thrill and surprise. The intrigue and creepiness factor builds up with each subsequent episode, gradually drawing you in. Before you know it, you’re ensnared in the mystery, working along with Kyle and Reverend Anderson to determine who’s possessed by evil and who isn’t. I grew up exploring a wide variety of horror, almost everything from Night of the Living Dead and Nightmare on Elm Street to Clive Barker’s Hellraiser franchise—so I’m not easily spooked, nor am I easily squeamish when it comes to gore. The element of horror that does scare me witless is the evolution of a character as his or her moral lantern gradually wavers, or dies out unexpectedly, transforming them into an unpredictable force of darkness beneath a poised façade. Outcast has this element in spades, though I believe it’s most prevalent in characters Blake (Lee Tergeson), Mildred (Grace Zabriskie), and Sidney (Brent Spiner). Blake, a possessed officer, is eerily nonchalant and boastful after brutalizing his friend’s wife. Tergeson is so convincing, I think many people would avoid him if they saw him on the street. Mildred, an elderly churchgoer—also possessed—has an unpredictable viciousness that one is uncertain how or when it will break the surface. Yet, Zabriskie interweaves a hint of frailty in an otherwise fierce and fearsome character. Aside from Blake, Spiner’s portrayal of Sidney frightened me the most, particularly as his sadistic nature escalates in episode six. In episode eight, he really cranks up the creep factor as his horrific backstory is unfurled, revealing the possibility that in some cases, perhaps demon possession works as a bizarre sort of counterbalance for some people. Spiner’s masterful performance is utterly chilling and downright disturbing (as it should be) partially because his portrayal of the lowest type of depraved individual is done so effectively. The evolution of his character’s demeanor and storyline takes a breakneck twist, yet the transition is carefully measured. The best way I can describe it is that in the time it takes for him to traverse a hallway and enter the next room he loses his mask. Only it doesn’t fall off. It melts revealing the monstrous persona underneath. The chemistry Spiner has with Fugit, Glenister, and Zabriskie, all remarkable actors in their own right, is pure perfection. Over all, the entire cast brings great tangibility to each of their roles and play very well off of one another. Part of Outcast’s brilliance is how it gradually humanizes some the demons, showcasing some of their boundaries as well as—in some cases—their ability to reason. Conversely, in numerous instances Outcast demonstrates the fact that evil doesn’t discriminate between demon, or human and that the latter are capable of unleashing their own brand of horror without supernatural help, often while upholding deceptive facades in the process. This makes it hard to differentiate the possessed from the non-possessed. In many ways it mirrors our struggle to determine such differences between honorable and deceitful people in reality. I think it also reflects the psychological struggle between the superego and the id, and the metaphorical demon in us all. All in all, Outcast is a phenomenal series with a dynamic cast, multi-dimensional characters and intriguing plot depth. I’m thrilled that it’s already been picked up for a second season. I’ll be watching! Outcast airs Fridays on Cinemax (check your local listings for showtimes). This entry was posted in Reviews and tagged Brent Spiner, demons, gore, horror, outcast, Patrick Fugit, Philip Glenister, possession, review, Robert Kirkman, Thoughts, Wrenn Schmidt. Bookmark the permalink.